The Abilene, Texas branch of the YMCA selected SIDesign to redesign and print its summer program brochures for June-August of 2013. Originally designed internally, the YMCA was looking for a fresh look to provide information to its current and potential members for the summer months. The YMCA elected a full-color 11″X17″ fold-over brochure that could either be mailed or simply distributed at one of its two sites. For more information on how SIDesign can help you with your next project. Visit the Brochures Page! Proforma Sports Printing selected SIDesign to create the football, men’s basketball and women’s basketball media guides for the 2012-13 school year. The MSU Bears are located in Baltimore, Mary. and compete in the NCAA Division I and the MEAC. The completion of the publications were completed entirely with the cooperation and support of the Morgan State Athletics Communications staff and SIDesign. 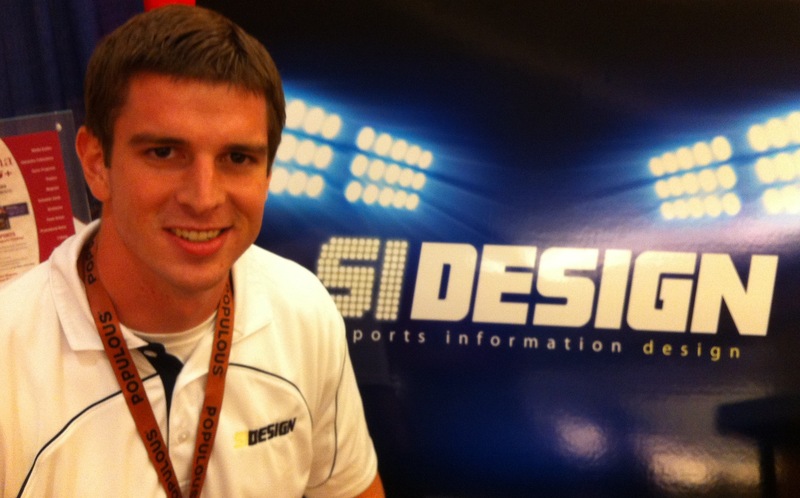 I had been an SID for six years (full-time) and had never attended a CoSIDA convention. I began the 2011-12 school year as the SID at McMurry University in Abilene, Texas; so I was still officially a member. When I branched out on my own after the 2011 football season to start Sports Information Design – and eventually to full time in March of 2012 – oddly enough I decided this would be the year to go. I would have been interested in attending some of the sessions just out of curiosity’s sake, especially those on social media, the exhibit hall was open during these key sessions, and I had to man my booth. However, I enjoyed being amongst former colleagues who have now become potential customers, and hearing from new SID’s on their needs and perspectives of what they need to do business. Much of what SIDesign offers has to do with the design and layout of printed materials. However, as SID’s know, depending on a budget and the stubbornness of coaching staff’s expectation, printed media guides are becoming a thing of the past. The industry is embarking on new challenges; online versions of media guides, record-book only publications, or simply using the variety of athletic web site providers to post all the pertinent information for the media are beginning to take over. This does not discourage me, as there will still be a market for design, branding and appeal for items distributed to fans and alumni at games or gatherings. But, it will challenge me in the near future of how to stay relevant. The other thing I learned quickly is the power of Twitter. In my personal life I have begun posting much more on Twitter than Facebook for my own account and my newly formed business accounts. Facebook has its advantages if you want to show off photos or portfolios, but I really believe Twitter is the best social media platform for the SID and media industry over Facebook. Everything from my announcements about the free media-guide cover design, to my ejection from the ESPN reception for changing into jeans was re-tweeted throughout the week. I was a small part of the much larger and impressive feat of #CoSIDA12 trending nationally for the better part of three days. If that doesn’t show you how powerful you can be with your fans and alumni base, I don’t know what will. Networking is the obvious advantage of any convention, but I wanted to share the appreciation of the network that SIDesign experienced this week. • Ron Fauss of Proforma Collegiate Solutions for letting me share, and at times hi-jack our booth. Ron was formerly of MultiAd and is committed to helping the departments committed to the printing of media guides and recruiting guides continue to produce these pieces at affordable rates. And now, luckily SIDesign gets to join in many cases with Ron and Proforma for the creative direction of those publications for departments that don’t have in-house designers. • Bob & Robby Kerch of The Rush – I met Bob & Robby this week (although I had spoken with Robby while SID at McMurry) and I believe that The Rush is something that many people are going to look back five or 10 years from now and wish they’d gotten in on the ground floor. In my interpretation, the company provides real-time highlights to your mobile phone that you can share. Their service will include everything from the pros (ideal for fantasy sports owners) to high schools. I think it would be an awesome tool for small-college SID’s who stream live events to get involved in engaging their fans in cutting edge technology. They could follow their small-college stars on Saturday and NFL quarterbacks on Sunday. • Jeff Rubin, Dave Meluni, Joe DeBenedictis & Chris Kirkegaard (Dustin Pedrioa look alike contest winner) of SIDEARM Sports – There was a time when I thought I should have been on payroll for the amount of referrals to SIDEARM after I initially signed up with McMurry in 2007. I have dealt with all four of these men on the phone and through email multitudes of times. They were always incredible to work with, and getting the chance to meet them and hang out with them at their reception was awesome. I feel like SIDEARM does everything well, and while their 582 clients speak for themselves, I won’t be surprised when they start landing SEC and BIG XII schools in the future; their versatility in web & mobile engagement and second-to-none design work give them a chance to be a monopoly in the business. • Greg Weghorst of the American Southwest Conference. Greg is a close friend and was / is the media relations contact for the ASC for which McMurry was a part. The Division III conference is a solid, well-run organization and Greg has been especially supportive of SIDesign since I left McMurry following the football season. He also sported the ever-stylish SIDesign polo Monday and served as a free billboard. Finally, a congratulations to Michael Schroeder of Western Kentucky for winning the media guide cover design drawing. I hope to make the Hilltoppers proud with whichever sport they choose to let me create. And most finally, thanks to all who stopped by the booth to find out more what SIDesign was about. I’d love to serve you and your athletic department in whatever way I can and provide relief in the middle of those 70-90 hour work weeks that are sure to be haunting you soon. Please take the time to check out our web site to see what we’re about and look at a portfolio of SIDesign’s work. And, social media love is always appreciate on Twitter & Facebook! Orlando in 2013! And I hope blue jeans are okay. When Abilene was selected as the first city in Texas to have a D1 Sports Training and Therapy Center in association with Texas Sport and Spine, TS&S wanted something to make their facility pop. D1 Sports Training and Therapy is a facility that aims to prepare athletes for the next level of competition. Dr. Dan Munton the owner of TS&S along with Vickie Meyers, director of operations, wanted to put their own spin on the facility. Munton grew up a man of faith and had a love for athletics; he wanted to incorporate a biblical message in a mural format featuring pictures of athletes of all ages. TS&S selected SIDesign to complete a nine-banner mural that spans the back of the building on Ridgemont Drive in Abilene. Each banner was 15-feet tall with varying widths. To learn more about how SIDesign can help you with large-scale projects, both indoors and outdoors visit the Large-Scale Projects page. It’s more affordable than you think, and no size is too small!